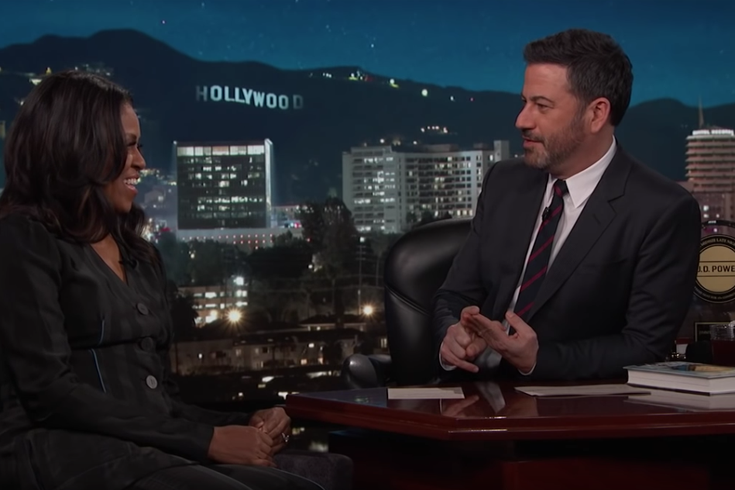 Michelle Obama appears on "Jimmy Kimmel Live!" Thursday night to promote her new memoir, "Becoming." Michelle Obama, who is coming to Philadelphia Nov. 29, admits that now that her husband is no longer president, Barack Obama is a little on the boring side. Appearing on “Jimmy Kimmel Live” Thursday night to promote her new memoir “Becoming,” the former First Lady also dived into topics normally taboo when she was in the White House and gracefully aimed a few barbs at the Trump Administration. Kimmel referenced Melania Trump - who earlier this week publicly requested that a top level White House security aide be axed - by asking Obama how she would have asked to have someone fired in Barack’s administration. She talked about some of the oddities to being First Lady, including having to organize the schedules for their dogs, Bo and Sunny. She told Kimmel, "I would do briefing requests for them. They had to get my permission. I would find, in my briefing room, it would be like, 'Can Bo and Sunny stop by this press event?' There would be a time and I had to approve of it."